It sounds like something from the well-worn pages of a Western novel: the bad guys sneak in the dead of night, round-up the livestock, and drive the herd away. Except modern day rustlers use horsepower instead of horseback and head for the nearest highway. They know it will be hours or possibly days before their heist is detected. Whether they’re small-time pickers going after a couple of calves or an organized ring filling a semi-truck, rustlers are taking full advantage of the proverbial ‘cash cow’. Of course, it’s not just cattle that are targeted—any type of livestock is at risk. Ranchers and farmers are commonly advised to register branded or tagged animals, rotate feeding schedules, lock gates, maintain fences and add lighting. But crooks will find a way around any measure if they don’t believe they’ll be caught in the act and the payoff is worth it. Video surveillance is a time-tested method of monitoring and identifying criminal activity, but conventional closed-circuit cameras and alarm systems have not proven to be the most practical solution for agricultural facilities. Mobile Pro Systems’ products, however, are different: they were engineered for deployment where power sources may be limited and are meant to provide accessible, remote viewing capabilities. 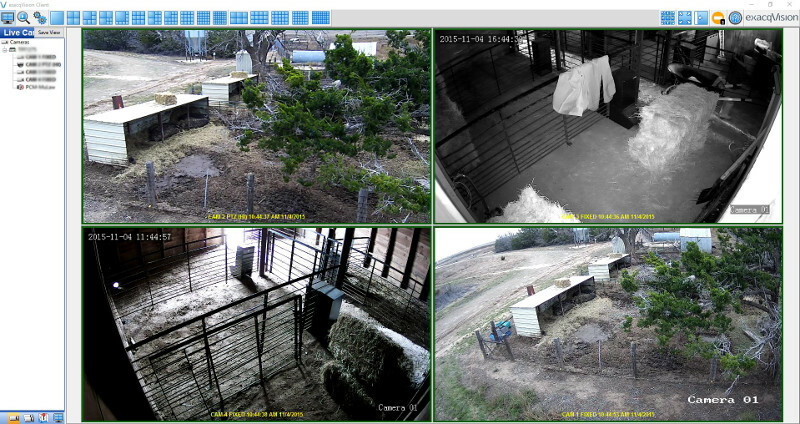 Screenshots from Power Sentry cameras installed at a hog operation in the Southwest. Cameras may be controlled for panning (PTZ upper left) and zooming from your home office or on the road. Mobile Pro offers a full range of mobile surveillance systems including pole or building mounts, trailers, and towers to help you take back the reins on theft and safeguard your property. If you have concerns about how to secure a particular facility or location, we’re here to help: 651-434-2333.